I love the Soulard area in St. Louis. The cornerstone of this neighborhood is the oldest Farmers Market west of the Mississippi. The historic Farmers Market has fresh produce, baked goods, exotic spices, fresh flowers, handmade soap, and more. Open on Wednesday-Saturday from 8:00 a.m. to 5:00 p.m. (6 AM on Saturday mornings) the market is open year round. 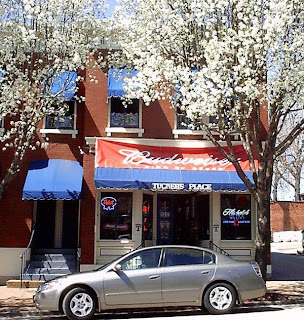 There are dozens of really remarkable restaurants in Soulard but my favorite is Tucker's Place (2117 S. 12th Street). Located in an old house, Tucker’s is known for its casual atmosphere and excellent food. The menu includes a steak collection, fish, pizza and their ever so famous burgers. My favorite – the pork chop. Some top secret marinate makes the taste a memory you just have to return to regularly. If I lived in St. Louis, I would be there every week. The portions are enormous so dine here to get a bang for your buck. The prices are also reasonable. Always a line but well worth the wait. 1/3/2010: AN UPDATE TO THIS POST. I cannot believe that after looking for so many years that Sunset Foods grocery finally carries the "secret" marinate - Andria's Brush On Steak Sauce. I was so excited when I saw it because I have been asking for it for I can't tell you how many years. I could not get home fast enough and brush some on a pork steak. It was just as good as I remembered. Look at your market and if they do not carry it, look at http://www.adrias.com/. They now have a website and will be a favorite for chops and steaks.